I think it is officially winter in Islamabad. We have awakened to cold, dreary mornings for two days in a row and we have been without our craft-while-we-sunbathe on the terrace for three. Winters in Pakistan are a huge challenge… why? You get none of the pretty snow… just lots of cloud, cold air and rain. It is just as well given the amount of dust in this country. Any snow would start looking like grey sludge anyway! The houses are built to dispel heat (this country of extremes has sweltering summers, did I mention that?) so you have to contend with bone-chilling drafts. If you have asthma like I do, get your inhalers ready. You get huge amounts of laundry and mess what with the sweaters, jackets, thermal garments and such that get trotted out with the onset of the cold season. Since the sun is hardly ever out, they will either (a) end up smelling musty because they take forever to dry or (b) end up smelling smoky because you put them in front of the gas heaters to combat (a). But ‘nuf said. It isn’t all bad here… We have it better than most, alhamdulillah. In terms of economics, this is also a country of extremes and I don’t have to remind myself of those worse off because they are around all the time. The cold makes pink tea all the more satisfying. If you don’t know what pink tea is, you have been seriously deprived! It is a brew of Kashmiri tea leaves and fragrant spices that has simmered for ages till it is attains a gorgeous deep colour and flavour. Add some milk, crushed almonds and sugar and you have just about the most delicious beverage this continent has produced. Fabrics… this country is teeming with fabrics. In winter you get lovely karandi – a textured cloth much like linen – and in summer, vibrant lawns. There are beads, sequins, laces and ric rac galore! If you are a compulsive crafter like me, Pakistan is a great stop for supplies. Second-hand bookstores… I have found award-winning titles, encyclopaedias and lovely craft-books and magazines going for a song. If you are ever in F6 or F7, you will find me – fingers and abaya covered in dust – rummaging through the heaps of old books. Today seemed like an ordinary day. The heat and humidity made it oppressive and since my husband is away, I was destined to spend yet another day at home. I did a mountain of laundry, horsed around with the children, read till I was hoarse and napped. I woke up feeling disgruntled that the day had been boring… uneventful. Less than two hours later, while having dinner, we heard a loud blast. A bomb had exploded at a site where a lawyers’ rally was to have taken place. This was at a market that we frequent, less than five minutes away from our home. Sixteen people have been killed and more than 40 injured by the suicide bomber. This and recent events in the country have left us deeply saddened. You know, when your two-year-old is happy her uncle has returned home safely saying words, which she understands completely, “There was a bomb over there!”, you suddenly realise that uneventful is not something so bad after all. I had made a vow more than two years ago to chronicle life in Pakistan with as much detail and colour as I could. The digi-cam went awry on me and, I confess, I got fed-up and left the matter. It is only now that I am leaving that I have been (frenetically) trying to recapture my life in Pakistan. I thought I would write about glass bangles for a start – kanch ki choorian. Glassware and ornaments dating back to 800 BC have been found at various archaeological digs in South Asia. However, it was really under the Mughals that the art of glass engraving flourished. Today, bangles are an integral part of this continent’s culture. Slender and round, they are worn in the dozens, usually on the left hand since the right hand is for doing work. My first experience with South Asian glass bangles was in Bombay (Mumbai) in 1997. I was on a 6-week backpacking trip across India – we travelled from Delhi, through several Rajasthani states, Bombay, Hyderabad, Kerala and Madras. On our last day in Bombay, my travel companions and I explored the street bazaars. 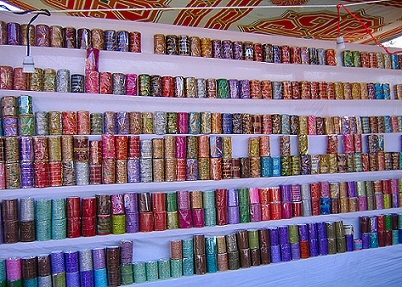 We were tempted by the pretty fabrics, sampled faluda and eventually stopped by an old lady’s stall. She had a lovely, if small, range. One of my companions, Aiza, was interested in buying a set, but was afraid to try it on. She had had an accident earlier that day at the train station and had bruises all over her wrists and arms which were tender to the touch. The old lady insisted that she try them to get the best fit and showed her how to put the bangles on. She waved away Aiza’s protestations and gently guided the bangles up her hands and wrists. Aiza winced at first in anticipation of the pain, but then smiled in surprise – the lady had so expertly slid them on that she did not hurt her one bit! 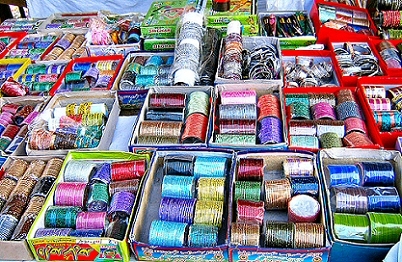 In Pakistan, glass bangles are just as popular. I don’t wear them myself but, I admit, I did enjoy dressing up my girls with them on `Eid and hearing the musical tinkle as they shook their wrists. Bear shucked them off and scattered them all over the house once the novelty wore off, but Marz took her bangles seriously and not a single one broke! To some these choorian may seem gaudy and I used to think the same, but I have grown to have a better appreciation of them. In a country where the majority of the population struggle to put food on the table, henna and glass bangles may be the only affordable ornaments for weddings and `Eid. Carefully chosen and matched with the right outfit, they can really add a touch of grace and glamour. They come in a bedazzling array of colours – iridescent shades of rainbow, solid jewel tones, pearly pastels – and some are encrusted with gold and silver accents, beads and jhumkas. They are versatile accessories that can be worn with both traditional and modern wear. I hope you enjoyed this little snippet… I’ll do another on our village trip next in shaa Allah. You know what is really sickening? It is that at a time of affliction and suffering, some people have raised the prices of food, medicine, blankets, clothes and even shrouds.